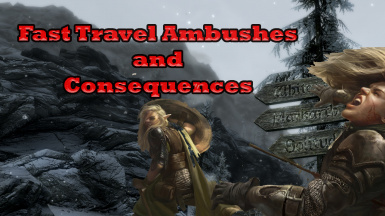 Lore friendly system which allows player to be ambushed while fast traveling, and incur penalties for not carrying enough food. 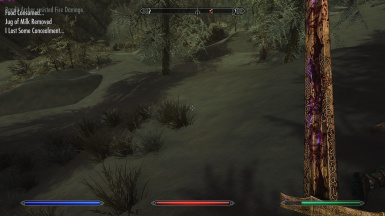 Ambush type depends on time of day, with night being more dangerous. Jebbalon and Lobo3222 provided invaluable playtesting, advice, and helped choose ambush spots. Lobo3222 for helping me with snapshots and final playtesting. 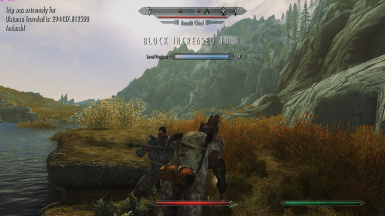 Jebbalon in 2019 for redoing mod!!! 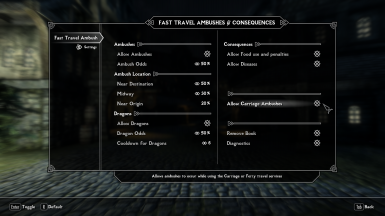 Player can set the odds of having an ambush using book menu. 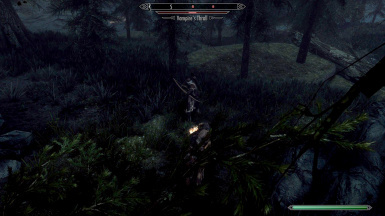 Ambushes are deadlier at night. Encounters happen in vicinity of fast travel origin and destination, and in between. SKSE64﻿ - REQUIRED for mod to function! Q: When I Fast Travel there are several loading screens, Why is that? 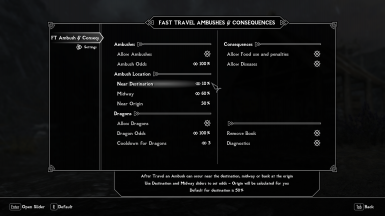 A: The mod works by detecting Fast Travel as it ends. You actually arrive at your destination, then we move you to a point along your travels and from there the mod finds a suitable location to place you and your enemies. Each of these moves can have a loading screen. It's just the way the mod works. Q: I used the Ferry in Windhelm to the Docks at Solitude. 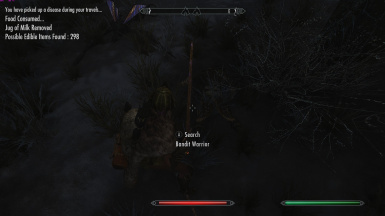 But why was I ambushed near a Bandit Fort with no water in sight !? That's when I heard the thud! An arrow! Just under the waterline. 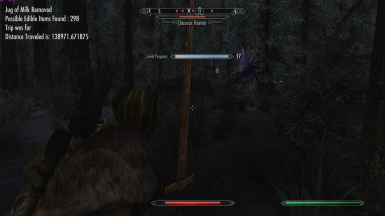 Bastards knew right where to aim. Sure enough, water started leaking in. I made for shore and tried to wake 'em. Guy was out cold. I turned and there were 4 of them. A bowman with an arrow in my face. Two strong types lifting the sleepy head out of my boat. The leader was just barking orders at everyone. They just left, headed inland. I was stuck there with a leaky boat and no help. 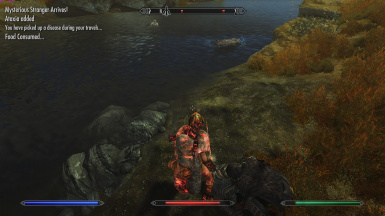 Now, I know how to patch a hole with Troll fat and Horker skin. Thing was, I was fresh outta adventurers to go get me some! You say he came to and took care of those fellas! Lucky they didn't get him into that Fort, I hear they do nasty things in there!" 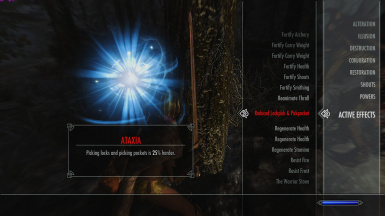 Q: bockyx asks - Whenever i try to fast travel to whiterun it always sends me to the stables, if i fast travel inside whiterun to dragonsreach it sends me back to stables lul. 2 - The mod works by calculating the distance traveled. Then it picks destination, midway or origin point to move you to for an ambush. The commands used to make this move won't pull you out of the City's worldspace. 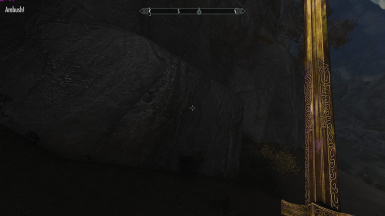 You end up in the LOD part of that space where nothing actually is. 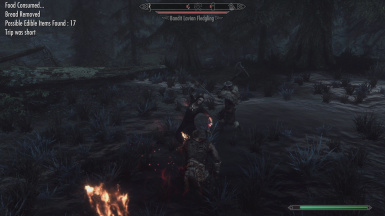 So we have to pull you out of the city with a different command first then allow the mod to pick where to do an ambush.Play with the settings for Ambush Odds to make it less likely to have an ambush. Then when it does you'll be surprised. Also, just get used to traveling to the stables. 3 - This is a good opportunity to actually role play! 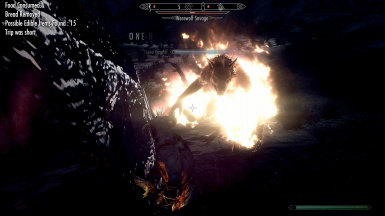 ........Traveling to dragonsreach all the way from the main gate in whiterun - you cut a corner where the cow is and slip in - oh! - for the gods sake! 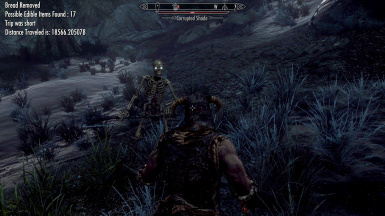 - you make it to the guard in front of the castle only to have him thrust a shield your way and make you back out of the city all the way to the horse trough at the stables cursing your stench to oblivion - He says " Wash! Then you can enter the castle! Ughh! "